Sponsored: How to rock stripes this season with fashion and accessories from Target! Two print trends ruled the runway for Spring – floral prints and stripes! One of this season’s biggest trends has been the vertical striped pant – in particular railroad style jeans. We prefer our stripes in classic black and white but adding color always makes it more fun. As you know, Target is the place to go for affordable, on-trend fashion and accessories so we stopped by the store (virtually) to pick out some of the best striped pieces for you to punch up your look this Spring. They’ve got a WIDE selection to choose from so we scoured the site and picked our favorite striped tops, dresses, skirts, shoes and accessories just for you! Get in the striped spirit – check them out! 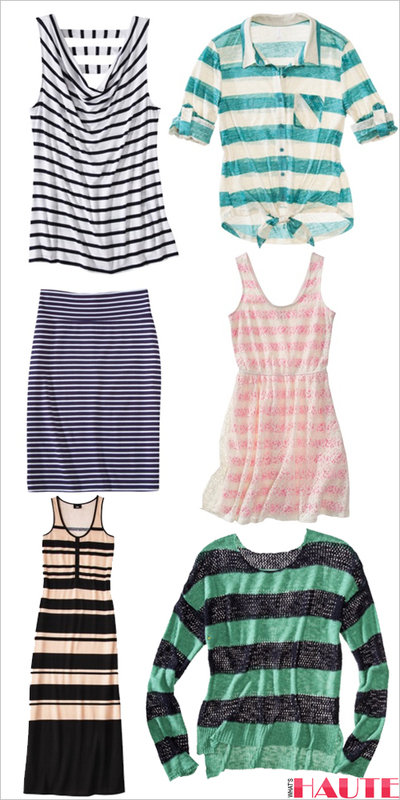 Striped fashions look great with everything from bold colors, to classic black or neutral colors, and even other prints! Do you dare to mix a striped top with floral print pants? Or how about polka dots? Try the Mossimo® Women’s Cowl Neck Tank in Black/White Stripe, Xhilaration® Juniors Boat Neck Open Knit Sweater or Mossimo Supply Co. Juniors Button Down Tie Waist Top. Just be sure to rock complementary color schemes to make the look work! For a more classic look, go with these pretty daytime dresses: the Mossimo Supply Co. Juniors Lace Overlay Fit and Flare Dress – perfect for work – and the Mossimo® Women’s Stripe Maxi Dress – Black/Blush – perfect for everything else! Also, this Mossimo® Women’s Plus-Size Ponte Stripe Skirt gives a bit of the nautical feel, especially when paired with a crisp white blouse or chambray top. Not in the mood for printed clothing? 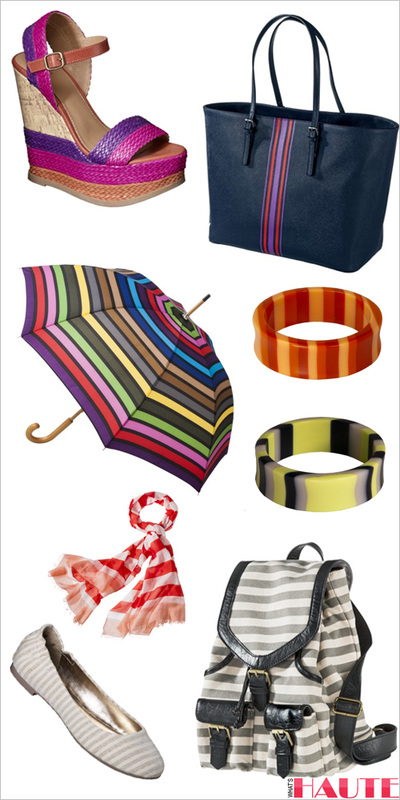 Then pair up your black and white, neutral or monochrome looks with striped accessories! For work days, the Merona® Stripe Saffiano Tote Handbag – Navy and Women’s Mossimo® Ona Ballet Flats are chic options, and don’t forget to bring your Multicolor Stripe totes Basic Stick Umbrella in case of rain! For summer weekend days at the beach or hanging out with friends, rock these Women’s Mossimo® Pemella Demi Wedges with Patterned Bottoms and stack several of these Multicolor Stripe Bangle Bracelets. For a more casual day, the Stripe Canvas Bueno Backpack makes a nice accessory. And the MERONA Pink Rubgy Stripe Scarf is a classic touch for women of all ages and styles! What’s your favorite way to rock stripes?